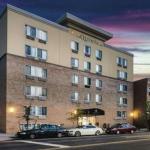 Internet access and breakfast are free at the La Quinta Inn & Suites Brooklyn Downtown. Opened in 2010 the six-story La Quinta Inn has a fresh modern feel. The dining area where the buffet breakfast is served is open and airy. Hot options like golden-brown waffles are on the menu as are baked goods fruit juices and freshly brewed coffee. Enjoy your meal with a complimentary morning newspaper. Contemporary amenities like free wired and wireless internet connections and flat-panel TVs with premium cable channels are found in the 72 rooms. Creature comforts like pillowtop mattresses are also available. Parking is available and pets are welcome both for an extra charge. Brooklyn's gorgeous Prospect Park is about a mile east of the hotel. The Brooklyn Academy of Music and the Brooklyn Museum are both around two miles away. The location puts you four blocks from a subway station where you can catch trains into Manhattan. LaGuardia Airport is 13 miles northeast and John F. Kennedy International Airport is 14 miles east.